« Changing Brokers is a Pain, Right? Right? Where, Oh Where Have My Trading Journal Comments Gone? 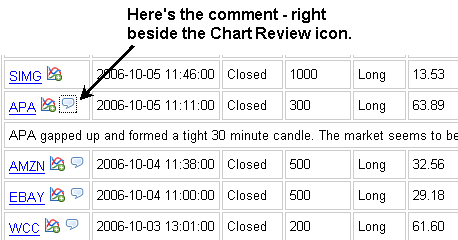 Some StockTickr Pro users have noticed that the comments they enter in their journal aren’t easily accessible after they close the trade. In fact, they weren’t displayed at all! I just added a comment icon in the journal for trades that contain comments. Just click on it to display the comments you entered for that trade. Click it again to hide the comments. Here’s a screenshot of the comments for a losing trade I made yesterday in APA. Posted in General, Tools, Trading | Comments Off on Where, Oh Where Have My Trading Journal Comments Gone?